I am so misunderstood! You’ve probably noticed… I have a bit of a jealousy problem. I am often possessive of the things that follow me. However, I am also a very loyal fellow and do my best to unify other words when letters and numbers have to be omitted. Even if you need to give the rights of ownership to a singular proper noun, or someone or something whose name already ends with an “s,” you should still add me plus an “s” after the noun. For example, if Sarah’s last name is James, you would write that Sarah James’s cookies are adorned with rainbow sprinkles. This applies unless you’re writing about someone as important as Moses or Jesus. In that case, you can just leave me hanging by myself after the “s” that ends their name. Don’t worry, I won’t be too lonely. Lastly, if you’re indicating belonging of something to a plural noun that ends in s, you only need to add me after the s. For example, if you want to remark on the sprinkles on the cookies, you would place me after the “s” in cookies. That way, everyone will understand that the cookies’ sprinkles are very colorful. Though I can get a little jealous of things that belong to me, I am also a loyal peacekeeper and try my best to help other words where I am needed. When letters have to be omitted in contractions, I kindly stand in the place of any missing letters to hold the word together. For example, if you wanted to combine the words “did” and “not” when complaining that Sarah did not want to share her delicious cookie, you need to place me in between the “n” and the “t” in place of the missing “o” so that I can hold the word together and help you to indicate that Sarah didn’t want to share her cookie. I know, I know, I’m a complicated bloke. However, we’ll get along fine as long as you remember to use me correctly and avoid my pet peeves. I absolutely detest when students try to use me for a possessive pronoun, or even worse, to form plurals. For example, there is absolutely no reason to use me when writing that Sarah has two cookie’s. There is nothing worse than hanging around in a word for no reason at all! It will also help if you remember that the word “its” is already possessive. You only need to add me between the “t” and “s” if I am needed for a contraction. For example, it’s now time for me to conclude this letter so I can go enjoy one of Sarah’s cookies. For more information on how to properly use apostrophes and other punctuation marks, check out our Apostrophes handout and the Quick Reference Flyer page of our website! When I walked into the University Writing Center early one morning, I did not realize that I would get the news of a lifetime. My boss approached me about transitioning from the receptionist position to that of a consultant in the UWC. After I heard the word training, my heart started to beat faster, a smile crept across my face, and I started to feel the adrenaline kick in. I have always had a passion for writing, and now I could share my passion with others. In order to officially become a consultant, I had to complete an intense training program to ensure that I could give every student reputable input. For example, each consultant must complete a training manual, read various books, learn about different formats, observe sessions with other consultants, participate in mock sessions, and review specific grammatical rules. By completing each of these steps, I learned many things that allowed me to become a better consultant. I saw how each consultant interacts with the students, picked up on different techniques, and gained a greater perspective of the services the Writing Center offers. Thanks to the intense training, every consultant in the Writing Center is qualified to help students with various steps of the writing process. For example, consultants are able to help with anything from the brainstorming process to formatting the works cited page correctly. In order to ensure that each consultant knows the correct information pertaining to these topics and everything in between, it takes most consultants a semester to complete the training process. Interestingly, it took me approximately one semester to complete my training. While it is a strenuous process, I would not want it any other way. I absorbed numerous lessons throughout training and discovered that the Writing Center is better than I could have ever expected. I found that each consultant wants to help students excel and expound their knowledge in writing; however, I realized that it is much more than that. Throughout training, I saw how every employee in the Writing Center genuinely cares about and loves each person who walks into the office. In every encounter, they want to be the light of Christ who shares His heart and Spirit. During times of confusion and stress, I witnessed consultants reassure students and encourage them. Nobody within the Writing Center wants a student to walk away from the office weighed down with stress or anxiety. Instead, they want to see students walk out of the office with their heads held high and a smile on their faces. During my training, I learned more about the writing process as well as the heart and mission of the UWC. I am incredibly grateful for this experience and am blessed to work in such an amazing office. I encourage everybody to stop by the Writing Center to meet some amazing people and receive help on a paper. I cannot wait to consult with you! 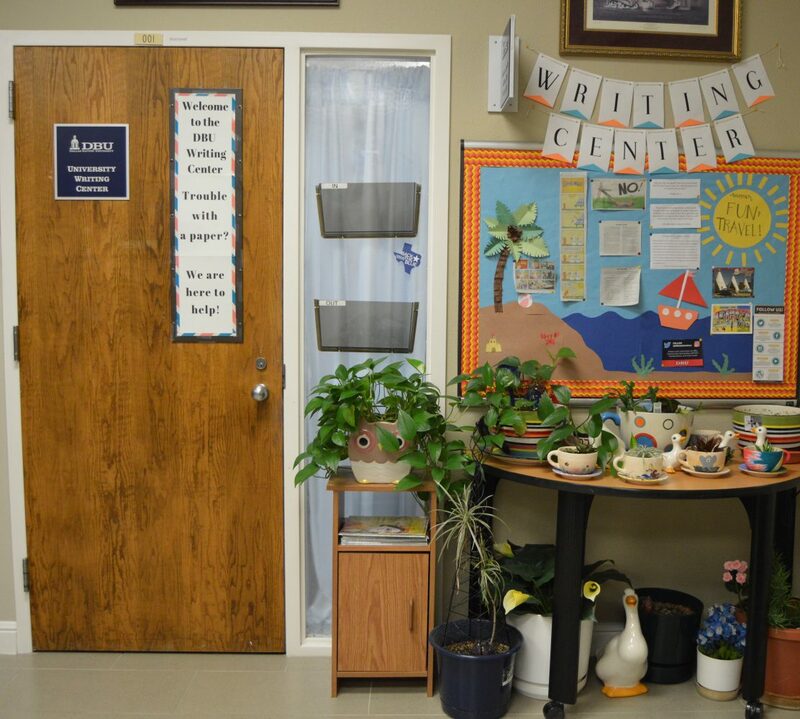 The Writing Center is currently hiring high-achieving English students who are interested in helping peers improve their writing. If you are interested in interviewing with us, please stop by our office in the basement of the Collins Learning Center (Room 001) to pick up an application today! Have you ever written a paper that you believed was almost perfect, but there was something about it that did not feel quite right? Well, I have been there before, and it is not enjoyable; however, I know something that might help. In those instances, you should look at the title of your paper. Now, your title can be direct and state the exact topic of the paper or it could be indirect and hint at the subject. When I was in high school, my teacher always asked for creative titles that pertained to our topics. For example, if I wrote a research paper on the consequences of stray dogs in neighborhoods, then my teacher would enjoy a title like The Ruff Life. She loved when students created a clever title that pertained to their topic because it showed they put thought into the paper. Clever titles are a fun way to grab the reader’s attention, but you must know some of the rules to ensure it is grammatically correct. When writing a title, you must capitalize all words except: prepositions, conjunctions, or articles unless they are the first word of the title. In the previous example I provided, I capitalized the because it was the first word of the title. When writing a clever title, there are a few errors that can be avoided to make it stronger. For example, you should not put quotation marks around the title unless a quote is actually found within it, nor should you underline the title. Additionally, as illustrated in my example, you should never place a period after the title of your essay. Now, say that you are writing an essay over the book, Great Expectations. It is better to create a unique title that is not simply the title of the book. Lastly, try to steer away from titles that are not original. If it is a title that has been used in numerous essays or papers, then think outside of the box. I always find it to be a fun challenge. After coming up with a title, it is important to place it in the right area of your page. For MLA, the title should be dropped in your heading and centered on the first page before your introductory paragraph. In APA format, it is centered on the first line of the title page and on the first line of the paper, while Turabian format requires it to go on the title page underneath the university’s name. Although this might seem confusing, the UWC has resources available within the office and online to clarify any questions you might have. I cannot wait to read some of your clever titles when you stop by the University Writing Center! For more information on writing a title and other writing subjects, check out our Writing a Title handout and the Quick Reference Flyers page of our website!